New book, 48 pages, MAA452. While small in numbers, the Belgian Army played a vital role in World War 1 that is often overlooked. Germany’s invasion of neutral Belgium, which led Britain to declare war in August 1914, should have been swift and fierce yet the unexpected heroic defence, against great odds, of Belgian fortresses, frustrated the German Schlieffen Plan for a thrust to Paris and a lightning victory. 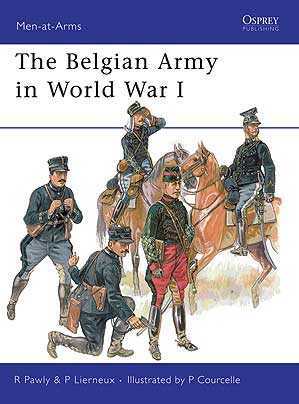 The plucky Belgian resistance proved successful in buying time for French and British troops to mobilize and report to the front, where the Belgians would then go on to fight, stubbornly defending the northern end of the Allied trench line for the rest of the war. Discover the story of this determined Army, from their organization and commanders, to their uniforms and equipment. The only main combatant army of World War I not previously covered by Osprey, this volume will be an important addition to any enthusiast’s collection, accompanied by detailed artwork and archive photographs.